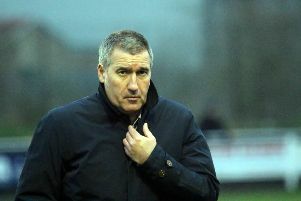 Banbury United boss Mike Ford was delighted with his side’s display as they finally got back to winning ways in Evo-Stik League South. Steve Diggin’s first goal of the season saw the Puritans beat Rushden & Diamonds 1-0 in Tuesday’s premier division central clash and Ford reckoned the first 45 minutes was the best his side has produced this season. Former Puritan Jack Westbrook got a straight red card just after the break but even against 11 players, United were by far the better side. Ford said: “We were excellent and in the first half our forward play was probably the best it’s been this season. If we’d have run out 4-0 winners I’m not sure they could have had any complaints. “It was a night of missed opportunities but not a night we missed out on the win. It was a much-needed and rewarding three points. “Right from the kick-off my players were at it and Rushden couldn’t cope with our pace and movement. “Our attitude was excellent, we didn’t speak a lot about tactics before the game. It was pretty basic stuff, we wanted to get at them early and break with pace and we ran them ragged all over the pitch.